Do you remember the four pig cutting boards from my August finds post? The one on the far left has actually been used as a cutting board and the three others were cut out and never used. I wanted to give the new pig cutting boards a darker finish so they looked older too. 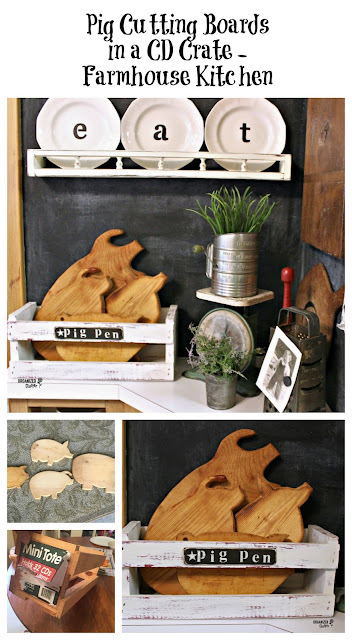 I searched for non-toxic stains on the internet and stumbled onto a post from Vintage Fan Girl in which a new cutting board was darkened with a propane torch. You must keep the torch moving and just burn the board lightly. The technique did work well on my pigs. To further darken the wood and enhance the grain, I rubbed on Miss Mustard Seed's Hemp Oil. Also non-toxic. This CD crate was purchased a while back at a thrift shop too for $2. I removed the label and washed up the crate. Next, I brushed on one coat of Rust-Oleum Painters Touch in Colonial Red . It is a satin latex. I then brushed on two coats of Dutch Boy Chalky finish paint in Antiquated Lace. I purchased this paint at our local Menards. I then moderately distressed the crate with a wet rag. The chalk paint rubs off with a little pressure and the wet rag, but the latex enamel stays in place. I sealed the crate with Varathane Clear Matte Polyurethane . It's a non yellowing water based poly for easy clean up, and a lot less hassle than wax. Lastly, I cut a sign board out of a free paint stir stick and painted it with Ceramcoat Acrylic Paint in Walnut . I then stenciled on PIG PEN with Momenta Alphabets and Numbers Adhesive Stencil , stencil paint from Ceramcoat Acrylic Paint in Light Ivory , and a stencil brush from my Dreamweaver Brush Set . The star is from another stencil in my stash. I nailed on my stir stick/pig pen sign and added my pig boards. I LOVE THEM, and I'm keeping them! They fit perfectly on the left side of my kitchen's corner display area. 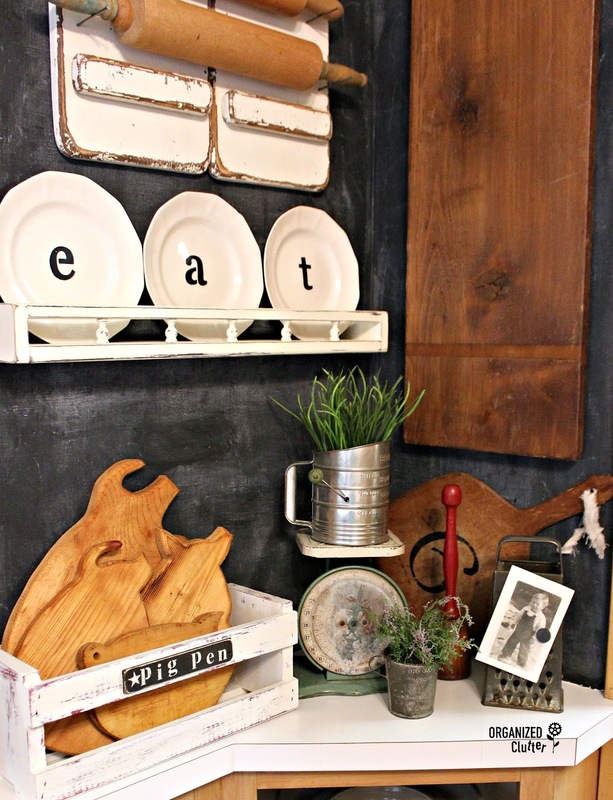 A welcome addition with my other cutting boards and farmhouse decor. The PIG PEN sign is kind of a groaner pun, but it makes me smile every time I walk by! Love your piggy's and their crate. Your really did a wonderful job on them and thank for the information on Pig Cutting Boards. MY son has a collection of cutting board and I am going to order one for him for his birthday, thank you for the information. We have a "pig board" that we use as a "guest book".... We keep it in the kitchen and have guests sign it when they come to visit... usually at dinner. It is a nice "history" of our home. How cute! I love anything pigs. 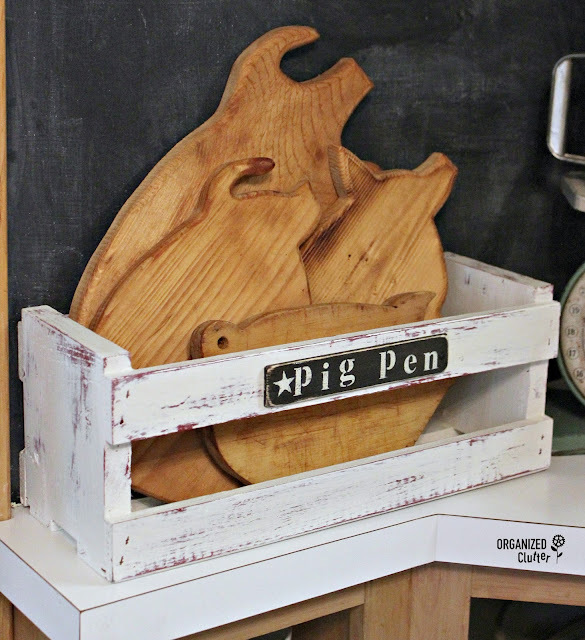 Fun idea by turning the crate into a pig pin for the cutting boards. I'm glad your keeping them, I know I would. We tried the torch technique once on a bar table the hubby was making. It worked great! Your "pig pen" makes me smile too. Beautifully done! 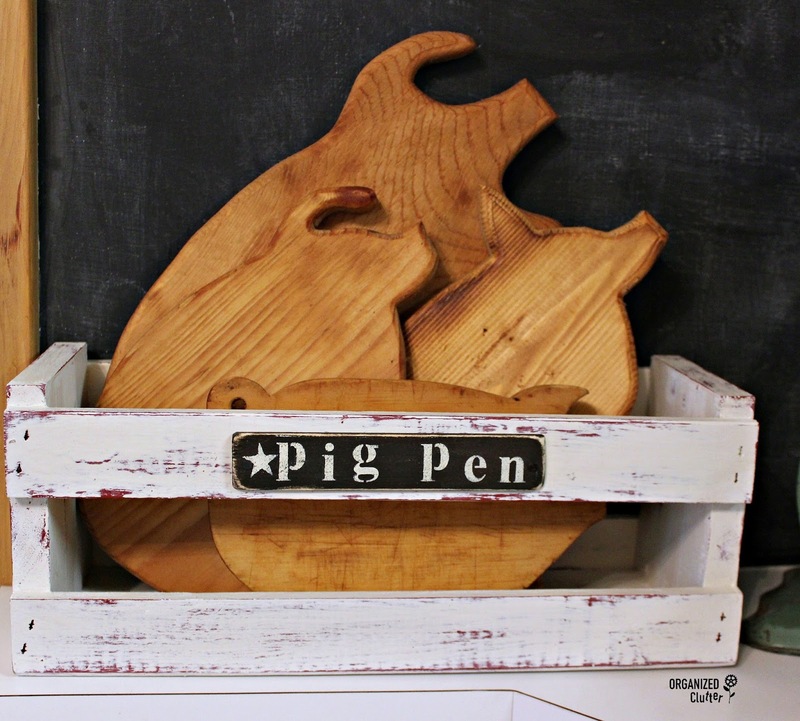 Your little piggy's and their pen are so cute and look great in your display! That is really cute! Love all your creative ideas! Too fun! 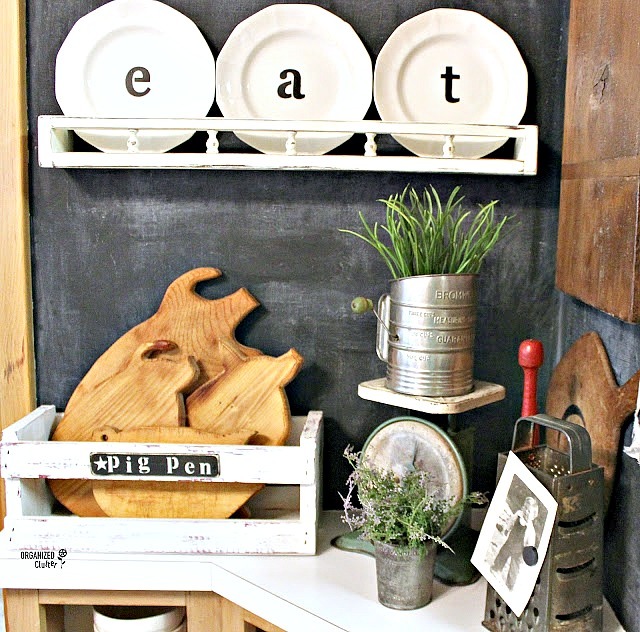 Those little piggies won't want to go to market when they have such a cut spot in your kitchen! Oh my goodness, that is just too cute! I have a pig cutting board someone made us for a wedding gift many, many years ago. It looks like the one on the far left. :) Love the "pig pen" too. Fun!